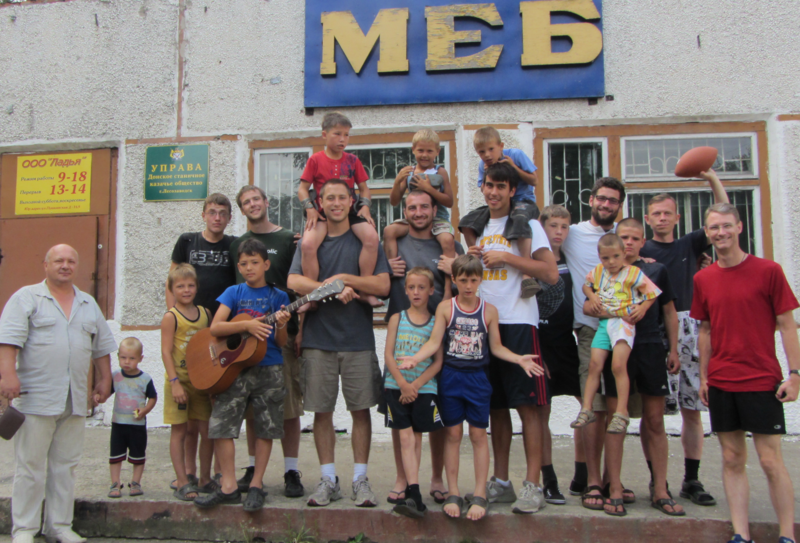 By far, the greatest need in Russia is for people to be exposed to the Gospel. Until people accept its truths and incorporate them into their daily lives, they will be lost souls. Recognizing this, we have implemented a remarkably broad array of programs to introduce people to the Faith and to help them grow deeper in their relationship with Christ. Some of our efforts are mentioned below. RCIA participants prepare to enter the Church. Daily and Sunday Masses. Sunday Mass is held at noon in Vladivostok, which allows people from far away to attend. Masses are celebrated in Russian. RCIA Classes. Every year, we have a number of people who come to learn the basics of the Faith. The classes culminate with Baptisms, First Communions, and Confirmations at the Easter Mass. Omega Program. Our outreach to the college community provides many opportunities for interested students to pray, study the Bible, take part in discussions on Christianity and morality, and to volunteer with our various charitable activities. More detail is given on our college outreach page. Online Courses. Our priests wrote several online Russian-language courses including an Introduction to Christianity, Christianity and Islam, and a Bible Course for Children. They are accessible to inquirers across Russia and the world. Music Society of St. Augustine. 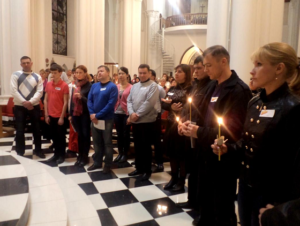 The society’s purpose is to find, translate, arrange, publish, and distribute Catholic hymns in the Russian language. Russians love to sing and good, solid, Catholic hymns are an excellent means to convey and express the Faith. Sacred Music Concerts. Our most successful evangelization tool, these concerts attract believers and non-believers from throughout Vladivostok. Further information on the Music Society of St. Augustine and the Sacred Music Concerts is provided on the page describing our music programs. Parish Bulletins. Far more thorough than regular Sunday bulletins, these include information on saints, feast days, Church teachings, sacraments, and much more. They are helpful and informative not only for local parishioners, but also for Catholics who live far away, who can attend Mass only infrequently, or who are homebound. Annual Youth Conferences. For Catholic young adults who wish to learn more and take a deeper plunge into the Faith, these annual summertime conferences have grown increasingly popular. Over the last few years, American college students from FOCUS (Fellowship of Catholic University Students) have also come and assisted at the conferences. Annual Children’s Camp. This event allows children to enjoy the summer camp experience while learning more about Catholicism. Novitiate. Seminarians who spend their year of novitiate with us also attend college classes in Vladivostok. Our novices are typically outgoing and friendly young men who are terrific evangelizers among their classmates. Sacramental Preparation. Our priests and catechists offer very thorough instructions prior to Baptism, First Reconciliation, First Communion, Confirmation, and Marriage. Special Conferences. We have hosted conferences on family life, fatherhood, abstinence, substance abuse, post-abortion syndrome, childhood development, and a host of other subjects where we have not only provided information that is difficult to find in Russia, but have also offered the Catholic perspective on these topics. Visibility. Thanks to the steeples we added to the church building in 2009 and the bells installed in 2010, Most Holy Mother of God Catholic Church is a much more visible entity in Vladivostok. To further increase visibility, we always invite the media to our special events. 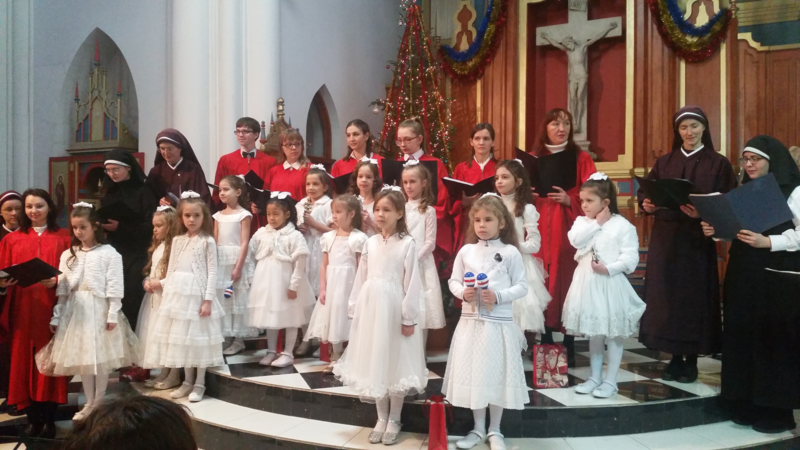 We now have wonderful friends from the local television and radio stations who have covered events such as the re-consecration of the church building and performances by visiting organists. The coverage lets people know that we are present and active, and that our doors are open. Fellowship of Catholic University Students with participants in our children’s camp. As you see, our work is wide-ranging and far more expansive than what is found in a typical parish. This is necessary because the Faith was so totally wiped out during the years of communism. To help us continue our catechetical and evangelization programs, click below.